Let’s have a little fun today with a growing problem. 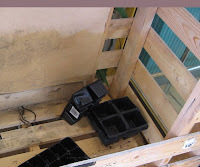 This initial modest posting is also going to grow and grow throughout the day… just as the towers of unused plastic plant pots do in our sheds, greenhouses, garages and various undisclosed parts of our gardens. It's just past midnight as I post this (early for me of late) but just in case any other bloggers wish to join me I thought I'd kick this off now. 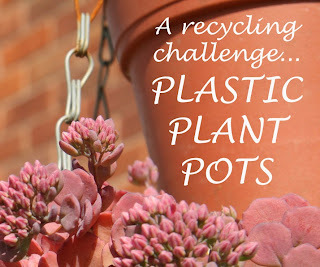 So to the big question... do you know anywhere that reuses or recycles plastic plant pots? Hello again… let’s start of this marathon! My first thoughts were to collect a list of places that recycle plastic plant pots roughly in my own area here in Scotland… mainly to garden centres I have visited. Last week, I chatted both by email and phone. At present, Stan is trialling this with New Hopetoun Gardens where Dougal told me “We have been looking to recycle pots for many years but opportunities have come and gone.” Growforth is using a good spread of size and type of centre including Merryhatton Garden Centre, Blacketyside Garden Centre and Highland Liliums. Links can be found to all centres below. The bin shown above was sited on leaving a Dobbies store. 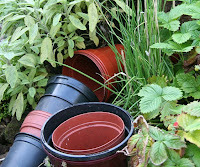 Reuse is the absolute best way to recycle plastic plant pots in my book. My thanks go members of the BBC Message Board for their ideas on this and their links to garden centres operating recycling schemes in their local areas (listed below). Top of the list for me on the re-use of pots must be growing on new plants through seed, cuttings and division in them to pass on to family and friends. Using up pots for selling plants at local fetes, charities etc is brilliant too. Ah… but I loved this story shared by Nan on the message board: “There is an old chap who regularly has a plant stall at our local boot sale - his plants are really good and every so often I take him a bin liner full of pots and plastic trays.” That’s a thought now too, as is asking any garden clubs, schools or small nurseries (for plants or children) if they would like your surplus plastic pots. Children could have great fun with used plastic plant pots like redecorating the outside in a variety of ways as gifts for Mums/Dads Grandparents… perhaps even planting bulbs in them. 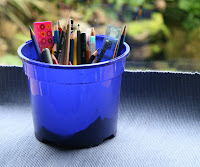 Thinking on the coloured type they could use them as pencil pots (smaller than the one shown), cones for obstacle courses and homes for wildlife. Hey… how about a large paper mache balloon, thin wire and a soft toy or two to make a store for teddies! Oops… I’m getting carried away here now. For the bigger kids (golfers ;-) perhaps turned on their side a variety of sizes could be used (based on skill level) to putt golf balls into! This is just one many excellent ideas for reuse in the posting by Colleen on 25 ways… listed in the link list below. Fantastic Shirl - this challenge is a real winner. I'll come back later and have a proper look round! PS: I also left a late comment on your 'Back to the Wild Side' post. Am on holiday in n.wales at the moment watching torrential rain so catching up on blog reading! Woud contribute to this but I am pretty sure there are no pot recycling in my area. I do reuse all my pots until they break. I don't know of anywhere locally that recycles I'm afraid and I didn't notice anything at our local Dobbies. I'm sure there must be places though, I know B&Q has recycle bins I'm unsure if there are plastic ones though. The next trip to Dobbies (when I will not buy anything, no no no, honest!) I'll take some along and ask if I can recycle them. Hi again Jan, thanks so much! Yes, I completely understand. Yes, indeed I do believe you are right although I have run out of steam for tonight! I’ve added what will be a permanent link for this. Looking forward to adding more tomorrow but for tonight I think I’ll catch up on some fav blogs before trying to get a semi early night. I’m guessing your squirrel is a grey one. Funnily enough, I was thinking of you the day the GSCE results came out. Delighted to hear your son got on so well. Meant to leave a comment… actually maybe I did… too tired tonight sitting here! From my very hazy memory tonight… did you not have a son passing a driving test recently too? Spookily, my eldest daughter also did today :-D Oh… when the car leaves the street…. I’ve still to hear back from local councils in a list WRAP emailed me. Distractions at home today slowed my progress (daughter passed driving test… Whoopee!!) but this is one that I see as an ongoing challenge and I will keep updating it. I’ve now added what will be a permanent link on my sidebar. Glad you mentioned the allotment here as I plan to mention them in my ongoing posting too… Farmers Markets were another. Great idea Shirl, our council does take them as part of the general recycling they do, but I've often wondered why the garden centres don't have drop of points for them. Good luck with the campaign. So, my additions to this posting will have to wait until tomorrow now… as once this hog moves out to go on its wanderings once more (estimate an hour after it arrived) I'll be editing this footage and posting it! Can't believe I caught it appearing inside... this is a first!! Just crept in with a pot update from over at mine. I've had a commenter tell me that in Ontario, her garden store gives customers a 5 dollar voucher for evry 25 pots they bring back. What a great idea!